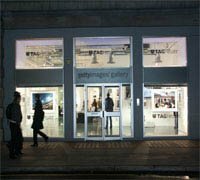 The Getty Images Gallery is London’s largest independent photographic gallery. The gallery is owned by Getty Images Inc., a company based in the US and which has an archive of over 80 million images. Getty Images Inc. was established in 1995 with the intention to bring the stock photography business into the new digital age; they were the first company to license imagery online.